After a hectic day, the last thing you want to do is stand in line trying to get your banking done. Yet, with the rise of online banking, waiting in line doesn’t have to be an issue anymore. Now you can do your banking without even leaving home. Online banking is not only more convenient but gives you the ability to save money, time, and even the planet. Keep reading to learn more about why online banking is better than traditional banking. Brick and mortar banks have enormous operational expenses that online banks simply don’t have. For example, they need specialized buildings to secure your money, state-of-the-art technology and equipment, and a large staff. They’re in the business to make money, not just store yours. That means fees go up when the bank’s expenses go up. With online banking, fees are kept to a minimum because the bank’s expenses are kept in check. Meet your new bank account. No hidden fees. Get paid up to 2 days early. Free to sign-up. Traditional banking hours aren’t always convenient. For some of us, getting to the bank before closing means leaving work early. It can also mean fighting traffic in the middle of the day, taking time off work, and waiting in long lines. If you do your banking online, there is no traffic and no banking hours. Yes, you may end up on hold waiting to talk to a customer service representative, but at least you can get stuff done while you wait. Most banks will let you make your deposits through one of their many ATMs. But what if you’re not near one of these cash machines? With online banking, making a deposit is as easy as snapping a picture and uploading it to an app. No added stops and no worries about leaving your deposit in an ATM all night (and hoping it’s picked up in the morning). But, if you really want to go to an ATM, most online bank accounts now offer access to a broad ATM network. 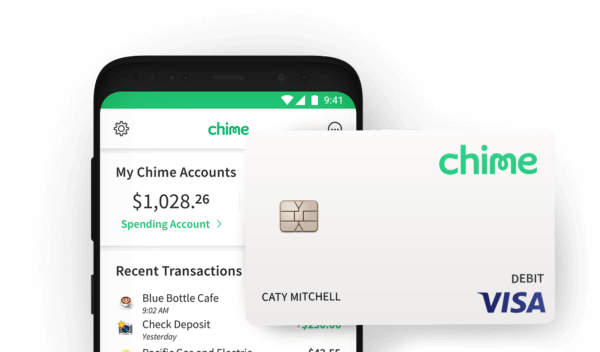 Chime, for example, allows its members to use more than 30,000 ATM locations nationwide – for free. With online banking, saving has never been more simple. For example, you can set up automatic transfers to move money from a checking account into your savings. You can even start small by having Chime round up each transaction made with your Chime debit card. The rounded up amount will be automatically deposited into your savings account. If you want to take your savings efforts further, you can automatically move 10 percent of your paycheck into your savings account each time you get your paycheck. This way your savings is funded with very little effort. Because there are no buildings to staff and maintain, digital banks can often dedicate more resources to their customer service department. When you have questions or concerns, you just have to call. With customers all over the US (or perhaps even the world), the customer service departments at online banks are usually available outside regular business hours. Plus, if you don’t want to pick up the phone, most online banks offer chat features online or via an app. Online banking is a great tool. But remember, before you make the switch to an online bank, look at your own banking habits and determine if it is the right move. Do you like going into a branch and talking with your banker or the tellers? If so, you may want to stick with a brick-and-mortar bank. Is it a pain in the neck to get to the bank? If so, an online bank may be your best bet. Do you have complex interactions that are easier done in person? If yes, you may be better off with your current physical bank branch. As you can see, it’s up to you to decide what type of banking is best. Just keep in mind that if you’re looking for convenience and lower costs, you may want to keep your bank in your pocket.